Aleksander Čeferin (born 13 October 1967) is a Slovenian lawyer and football administrator. Between 2011 and 2016, he was President of the Football Association of Slovenia. Since 14 September 2016, he has been the President of UEFA. After graduating from Ljubljana University's law faculty, Čeferin went to work for his family's law firm, developing a special interest in representing professional athletes and sports clubs. He later took over from his father as company director. Čeferin took a formal interest in local football in 2005 through his work with the executive board of futsal club FC Litija. A member of the executive committee of amateur side FC Ljubljana Lawyers since 2005, he served as a member at NK Olimpija Ljubljana from 2006 to 2011. In 2011, Čeferin was elected President of the Football Association of Slovenia. He also served as a second and third vice-chairman of the UEFA Legal Committee from 2011 to 2016. On 14 September 2016, Aleksander Čeferin was elected the seventh President of UEFA, automatically becoming vice-president of FIFA in the process. He polled 42 votes at UEFA's Congress in Athens, beating Dutchman Michael van Praag who received 13 votes. Čeferin's presidential manifesto and campaign centred on the need for UEFA to adopt good governance reforms and his proposals were approved in April 2017 by the 41st UEFA Ordinary Congress in Helsinki. These reforms included the introduction of term limits for UEFA presidents and UEFA Executive Committee members and the provison that Executive Committee candidates must hold an active office (president, vice-president, general secretary or CEO) with their national association. Other Statutory changes approved at this congress in Helsinki included the strengthening of the UEFA Governance and Compliance Committee with two additional independent members and the granting of two full member positions on the UEFA Executive Committee to representatives of the European Club Association (ECA). A representative of the European Professional Football Leagues (EPFL) was later also added to the UEFA Executive Committee in February of 2018 at the 42nd UEFA Congress in Bratislava. One of Čeferin’s initial priorities was to work on ways to improve competitive balance in European Football and to reduce the gap between the elite clubs and the rest. A series of meetings were held at the UEFA Headquarters in Nyon with key stakeholders to align on a strategy and to explore options available. Čeferin pledged to strengthen the UEFA financial fair play measures put in place in 2009 and indeed supervised amendments to the regulations for the new competition cycle 2018-21. Thanks to FFP, European clubs reported €600 million in profits in 2017 compared to the €1,700 million combined losses in 2011. Čeferin has always refused the creation of an independent Super League and has guaranteed it would never happen on his watch. His stance has been repeatedly supported by the President of the European Club Association Andrea Agnelli and both showed a united front on this matter in a joint press conference in Brussels in November of 2018. As part of his objective to consolidate communication and collaboration with key football stakeholders, Čeferin has also worked to strengthen ties with members of the European Parliament, Council of Europe and European Commission. The investment in grassroots and women’s football has been at the core of Čeferin’s mandate and while record grants for the development of football were announced at the 42nd UEFA Ordinary Congress in February of 2018, UEFA also pledged to increase the funding of women’s football development projects by 50% in October of 2018. He also oversaw the signing of UEFA’s first ever sponsorship deal dedicated entirely to women’s football in December of 2018. Čeferin was re-elected by acclamation for a new four-year term at the 43rd UEFA Congress in Rome on February 7, 2019. During his acceptance speech, the UEFA President reinforced a message of unity, ensuring “that European football remains united, that European football remains respectful, respectable and respected, and that European football continues to demonstrate solidarity and bring hope." Čeferin was elected chairman of the UEFA Foundation for Children in November of 2017, taking over from former European Commission president José Manuel Barroso. The UEFA Foundation for Children supports humanitarian projects around the world linked to children’s rights in areas such as health, education and integration. Also in 2017, Čeferin joined the football led charity movement Common Goal, pledging to give 1% of his salary to the organization’s charity projects. Čeferin was voted sports personality of the year in 2016 by Slovenian sports newspaper Ekipa SN. This was the ninth edition of the award, which is voted on by newspaper journalists and readers. In January 2019 SportsPro Media included Čeferin in the exclusive list of most influential people in the sports industry. The UEFA President was also selected as one of the people of the year by World Soccer Magazine in its first issue of 2019. Čeferin is a married father of three. He is fluent in Slovenian, Serbian, Croatian, English and Italian. He is a third-dan black belt in Shotokan Karate. He is also a motorsport aficionado and has crossed the Sahara Desert five times, four by car and once by motorcycle. As a teenager Čeferin served in the Army of the Socialist Republic of Yugoslavia in 1986 and later served as a Slovenian soldier in the war for Slovenian independence in 1991. 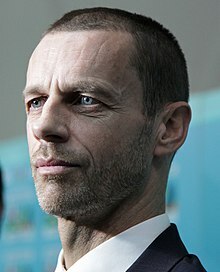 ^ "UEFA President: Aleksander Čeferin". UEFA. ^ "Čeferin Law Firm, Grosuplje, Slovenia". DCS. Retrieved 14 September 2016. ^ "Aleksander Čeferin". UEFA. 2 January 2011. Retrieved 14 September 2016. ^ "New president for Football Association of Slovenia". UEFA. 18 February 2011. Retrieved 14 September 2016. ^ a b c "Čeferin elected as UEFA President". UEFA. 14 September 2016. Retrieved 12 October 2017. ^ "CEFERIN Aleksander". FIFA. October 2016. Retrieved 12 October 2017. ^ "Aleksander Ceferin: Uefa elects Slovenia FA chief as new president". BBC. 14 September 2016. Retrieved 14 September 2016. ^ "UEFA approves term limits for top officials". Reuters. 5 April 2017. Retrieved 12 October 2017. ^ "Green light for reform proposals". UEFA. 5 April 2017. Retrieved 12 October 2017. ^ "Comprehensive bidding regulations approved for all finals and final tournaments". UEFA. Retrieved 27 February 2019. ^ "13th Extraordinary UEFA Congress decisions". UEFA. Retrieved 27 February 2019. ^ "European Leagues representative joins UEFA Executive Committee". European Leagues. Retrieved 27 February 2019. ^ "UEFA head Ceferin asks clubs for a fairer Champions League". Washington Times. Retrieved 27 February 2019. ^ "Professional Football Strategy Council meets in Nyon". UEFA. Retrieved 27 February 2019. ^ "'Let us not be afraid' - Aleksander Čeferin". UEFA. Retrieved 28 February 2019. ^ "UEFA chief vows to enforce FFP rules: 'We can't be a tiger without teeth'". UEFA. Retrieved 28 February 2019. ^ "UEFA makes FFP changes". Football Italia. Retrieved 27 February 2019. ^ "Club Licensing and Financial Fair Play". UEFA. Retrieved 27 February 2019. ^ "European Super League". The Guardian. Retrieved 27 February 2019. ^ "UEFA, Europe's top clubs dismiss threat of new competitions". Associated Press. Retrieved 27 February 2019. ^ "European Parliament gives backing to UEFA's policies". UEFA. Retrieved 27 February 2019. ^ "UEFA and the Council of Europe sign Memorandum of Understanding". UEFA. Retrieved 27 February 2019. ^ "UEFA and European Commission extend arrangement for cooperation". UEFA. Retrieved 27 February 2019. ^ "UEFA launches Together #WePlayStrong to inspire more girls to play football". UEFA. Retrieved 27 February 2019. ^ "UEFA increases women's grants". Inside World Football. Retrieved 27 February 2019. ^ "VISA signs seven-year sponsorship deal with UEFA". Reuters. Retrieved 27 February 2019. ^ "Ceferin re-elected UEFA President". BBC Sport. Retrieved 27 February 2019. ^ "Ceferin re-elected for 2nd term as UEFA President unitl 2023". EFE. Retrieved 27 February 2019. ^ "Ceferin becomes Chairman of the UEFA Foundation for Children". UEFA Foundation. Retrieved 27 February 2019. ^ "Our History". UEFA Foundation. Retrieved 27 February 2019. ^ "Aleksander Ceferin joins Common Goal". The Independent. Retrieved 27 February 2019. ^ "2016 Sports Personality". Ekipa SN. Retrieved 27 February 2019. ^ "SportsPro's 2019 Most Influential". SportsPro Media. Retrieved 27 February 2019. ^ "World Soccer January 2019". Keir Radnedge/World Soccer. Retrieved 27 February 2019. ^ "Aleksander Ceferin: a black belt in karate who dealt a big blow to the establishment". Telegraph Media Group. Retrieved 27 February 2019. ^ "Marcotti's Musings". ESPN. Retrieved 27 February 2019. This page was last edited on 13 April 2019, at 17:24 (UTC).